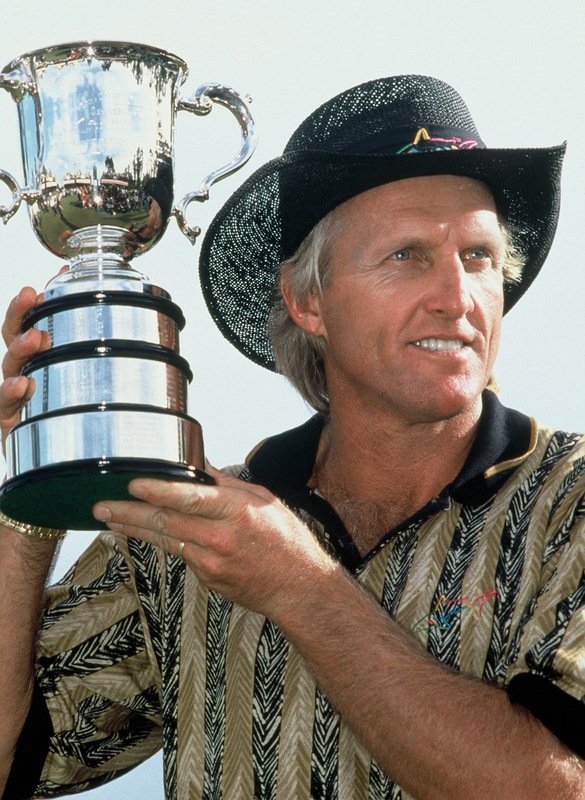 Greg Norman holed a 40-foot birdie putt from off the 17th green to set up a two-shot victory over fellow Aussie Peter McWhinney in the $850,000 Heineken Australian Open at Kingston Heath Golf Club in Melbourne. Norman described the win, his fourth in the Open and his 73rd worldwide, as satisfying because he played controlled golf, a contrast to his usual charging and aggressive style. The World No. 1, who started the day level with McWhinney at 6-under-par, was challenged throughout the afternoon by little-known Frenchman Jean-Louis Guepy, McWhinney, Craig Parry and Stuart Appleby in tricky wind conditions. As he held the trophy aloft after finishing at 10-under-par 278, Norman dedicated the win to a 12-year-old boy fighting leukemia in Melbourne's Royal Children's Hospital. "Michael, I won this for you," Norman said at the televised presentation ceremony. Later he explained that he had spent much of Saturday night in the hospital's isolation unit with Michael Gentile who is undergoing long-term treatment. "He's a nice kid and a keen golfer who will be isolated for some time," Norman said. "He told me he wants to be famous and asked me to say hello to him on TV. That's fine by me. We hope it picked up his spirits." Norman described the win, his fourth in the Open and his 73rd worldwide, as satisfying because he played controlled golf, a contrast to his usual charging and aggressive style of play that has produced his previous victories at home. "I just had to be patient," he said. "The wind was difficult but I gained confidence as the round progressed. One mistake on this course and you are out of the tournament. I felt I was in control of my game. I was playing like I did in the middle of the year but the control has waned since then." His putt at 17, when he was a shot clear of McWhinney, Parry and Guepy, charged the hole like a runaway train, hit the lip, hesitated and fell in for birdie. It gave him breathing space with one hole remaining but what would have happened if it had missed the hole does not bear thinking about. "It went in, that's all that matters," he said. Having won everything worth winning at home, Norman's next goal is trying for Gary Player's record of seven Open titles and reaching Jack Nicklaus' total of six along the way. "It is possible," he said. "I've always believed my 40s would be the best part of my career. I've got time left yet." Many people are wondering if McWhinney did something in a previous life that has condemned him to running second in the Open. He was runner-up to Steve Elkington in 1992, did not play for two years and was beaten by Norman. People were prepared to offer him sympathy and suggest that Norman got lucky with the putt on 17 but he was not having any of it. "I'm not disappointed," he said. "In fact, I'm delighted. I'm as happy as hell. I've just run second to the best player in the world. He is not only the best in the world; he is the best by a streak. Players in his class do things like sink that putt. It would have run eight feet past the hole and left him with a very nasty, downhill putt but he made it. Good luck to him. It was nearly game, set and match right there but I didn't give up." There was a glimmer of hope on the last hole when Norman's approach finished in a swale on the right of the green while McWhinney was putting for birdie but they both made their pars and earned $153,000 and $86,700 respectively. Guepy, 28, was the surprise of the week, and led the tournament from the fifth hole until he double bogeyed the 10th. He fought back with birdies on 12, 14, 15 and 16 to finish three shots behind Norman and had writers searching the record books for evidence of a good finish by a Frenchman anywhere else in the world. They searched as far back as 1907 when Arnaud Massey won the British Open but Guepy told them later that compatriot Jean Van De Velde won the Roma Masters on the European Tour in 1993. "I am happy with the way I played today," said the man who had two top-10 finishes in Europe this year. "I was feeling pretty good before I double bogeyed the 10th. I was upset but I hung on. I made a few mistakes but when you really look at it, I was beaten by a better player." There was some concern that his presence in the field would provoke political protest in the wake of the French nuclear testing at Muraroa in the Pacific. Officials were understandably jumpy with the memory of death threats and protests against Gary Player in the 1970s by anti-apartheid groups. "I've had no problems here at all," said the main who was once ranked in the top 200 of world tennis but switched to golf when tennis bored him. "I've been coming here for 10 years. I grew up in New Caledonia and I used to spend my holidays with my uncle in Brisbane playing tennis." He won't be the last promising tennis player who has switched to the Royal and Ancient game. Annika Sörenstam, who won the Alpine Australian Ladies Masters in Queensland last week and the U.S. Open earlier in the year is a burnt our tennis player. According to rumor, Ivan Lendl, who won just about every major title except Wimbledon, will try for his player's card at the Australasian Tour School in Melbourne next month. It is believed that Lendl, who played tennis right-handed but is a left-handed golfer, stands to win £1 million pounds from a London bookmaker if he can win a major.